Labor Day Offer — ORDER NOW for $25 and Get 3 GIFTS! Last chance to get a piece of history! We have a limited supply of the special 50 th edition of Kovels' Antiques & Collectibles Price Guide. Our exclusive Kovels' Antiques & Collectibles Companion 2018 eBook*, a $14.99 value! "The Top Ten Fakes that Fooled the Experts" booklet — a $7.95 value! Find a deal that just seems too good to be true? It might be. Make sure you’re getting the genuine article and save yourself the frustration of a fake! Our 50th Edition! Whether you plan to buy or sell antiques and collectibles, determining the correct price of your item(s) can be confusing. That’s why newbies and veteran collectors alike turn to the Kovels' Antiques & Collectibles 2018 Price Guide for help. The 2018 edition empowers collectors with the most up-to-date price information based on actual sales and market data. Featuring an easy-to-read format with tips, marks and logos, the Price Guide includes 20,000 prices and more than 2,500 color photographs. Unlike other price guides that focus exclusively on high-end antiques, Kovels’ covers American and international items you might already own. Plus, the 2018 Price Guide includes a special section reflecting on 50 years of collecting, prices, trends and surprises, chronicles the major events that changed the antiques market through expert eyes of Terry Kovel. It includes record prices for the year, and clever fakes —that even fooled the experts! Labor Day Offer — ORDER NOW and Get 3 GIFTS! 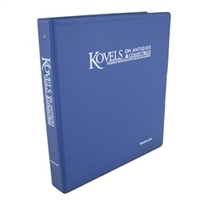 Don't cheat yourself out of the most accurate price information — order your new Kovels' 2018 Price Guide today!